Are you hosting a game night or movie night soon? If the answer is a resounding YES then you must think of getting TV trays for the big night. You may link it to a television but TV trays are just snack trays which help you to keep your snacks while watching television. It just makes snack binging easier and much more organized. The reason for getting a TV tray home is because you should not let the guests’ hunch over a coffee table to eat snacks. Let them enjoy sitting on the comfortable couch. This way you would be able to handle TV nights in an organized way! Also, nobody likes going to the kitchen or the dining table to grab the snacks during an important movie scene. It is best to keep a TV tray next to the couch or right in front! You have landed on the right page because we are going to tell you about the TV trays reviews. As a novice, you may require some guidance and you will get it right here! 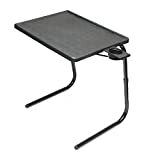 The Table Mate II Folding TV Tray comes in black and it is fully adjustable. You can adjust the table to six heights. Also, it has a versatile use! You can use it for eating, reading or working. We love it how it has a cup-holder which is built-in. The product can be stored easily because it has a compact size. The legs of the table can slide easily which makes it easy to use. It is a versatile product which can be used for a number of things. You can easily slide the product towards you. The product can be folded and stored easily. 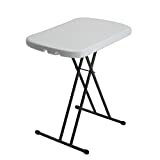 Lifetime 80251 Adjustable Folding Laptop Table TV Tray comes in white granite. It is known for its stability and strength. The product is durable and you can adjust it to any level! Yes, the good part is that it has an adjustable height setting. It can set from 21 inches to 28 inches. 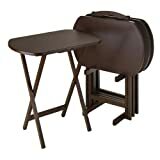 The product has a steel frame design which can be folded easily for storage. The product can be kept outside or inside the home. Do not worry about the weather as it a weather-resistant finish! Best for both outdoor and indoor use. Adjustable height setting – it can be set in three ways. Winsome Wood Alex Snack Table comes in 5 pieces and it has a smooth and broad top. The product can easily hold a large family meal. If you are having a Christmas party or a get-together, this product is great and also, it has an upright stand which allows you to store it. Assembly is required for this product. There is a stand for storage. It is constructed of high-quality solid wood. There are four snack tables. There is a large table top which holds a large meal. 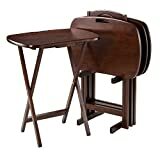 The Coavas TV Trays Portable Writing Desk Utility Computer Children’s Reading Table is portable and is known for saving space. The product has strong and sturdy legs. The legs are made of metal. 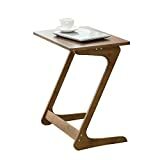 You can use this TV tray in a number of ways whether it is reading, writing, keeping snacks or using your laptop. The working space is large and you can easily keep your laptop on top of it. It can be assembled easily. There is an instruction which allows you to assemble it with ease. The design is simple yet contemporary. It has a large working space. The legs are made of metal. Also, it has protective pads on the legs which protect the floor from scratches. The round corners are safe. It is a versatile product. The Winsom Wood Lucca comes in 5 pieces. It has an elegant design and is made with portability in mind. You can easily move it from here to there since it has cut-out handles. In a nutshell, you would love the product because of its durability and convenience it provides. Also, the product looks great and will be a perfect addition to your home. The legs of the product are made of high-quality wood. 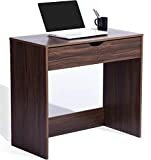 The NNEWVANTE Sofa Table TV Tray Super Top Laptop Desk Removable table is versatile and you can use it in a number of ways. It is made of a high-quality material such as natural bamboo. It is an environment-friendly product which is sturdy. You can give it to your friends or keep one at your home. We love the elegant look of this product! The product is easy to assemble. You can follow the instructions. It is made of high-quality material i.e. pure natural bamboo (100%). The Winsome Wood TV Tray Set has an oversized tabletop. It has a holder which makes storage easy. The rich walnut finish makes the product look exquisite. You would be pleased to know that the pieces of the product are water-proof. It is a great product to buy! 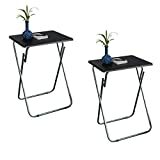 The eHemco Set of 2 Folding TV Trays is a durable product. The top of the table is made of MDF with a lovely black finish. The base of the tray is made of metal which makes it strong. The product looks stylish with a silver base and a black top. You can get another option in this in terms of color. Since it is lightweight, you can carry it easily. PJ Wood TV Tray comes in 5 pieces. The product is made from solid wood (plantation). You can easily fold the table for convenience. Storage is easy! Assembly is required for this product but it does not take the whole day. This set includes four tables which allow you to keep all the food items in an organized way. 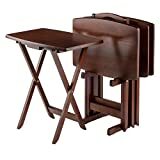 The table can be easily folded. Winsome Oversize snack tale set is ideal for keeping in the game room, kitchen or even your dining room. The extra snacks and goodies can be kept on this. There is an oversized top on which you can keep a large meal. You would never have a space problem! Assembly is required for this product but it will not take much time. Let us take a look at the key features of the product. Buy the best TV tray and bring home convenience and style. Did you get the much-needed information through the Best TV trays reviews? We hope so! Do choose a product from the above-mentioned list. The reviews are based on ratings and the reviews on Amazon. You would easily find all the products on Amazon and it is advisable for you to buy it from the same. Once you buy it from Amazon, you can be sure that the product can be returned or exchanged easily.